GIVEAWAY: Win one Cleanse, Cut and Finish at kimrobinson luxury hair salon | Beverly's Net: family. food. fashion. GIVEAWAY: Win one Cleanse, Cut and Finish at kimrobinson luxury hair salon – Beverly's Net: family. food. fashion. I visited kimrobinson recently to do a Cleanse, Cut and Finish with Timen Siow, an awesome hair stylist from the coveted creative team. The above photo was taken two days after I got my hair done there, using just my hands to finger-brush through. The blowout was done so impeccably that I had beautiful volume and silky straight tresses for days! I actually stretched it for 4 days (ahem) before I washed my hair. What makes the Kimrobinson salon head-and-shoulders above the rest (apart from catering to the celebrity crowd and high society cliente) is not just the luxurious experience of their gorgeous salon, but the incredibly personalised and attentive service you receive. Timen got me to stand up so he could view my hair at all angles, and in comparison with my body build. From there, he cut my hair to best suit ME. 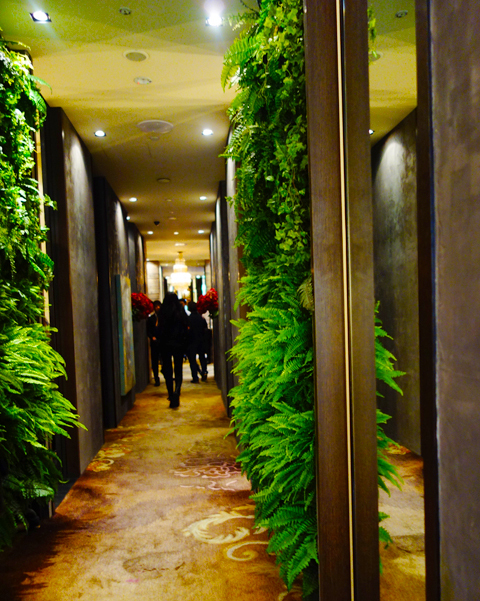 What can you expect to indulge in with their Cleanse, Cut and Finish? An ahhh-inducing head massage for at least 15 mins – done slow and firm to press all the right pressure points and relax you. 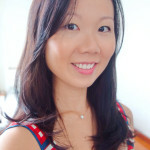 A personalised cut for a brand new look, by Timen Siow from the creative team! 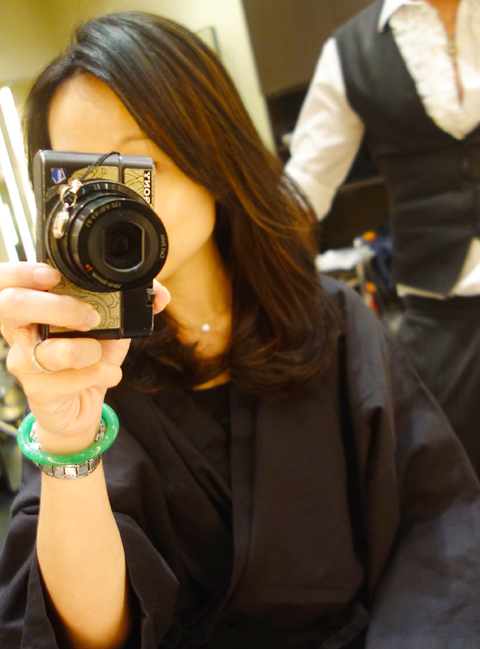 An expert blowout by Timen Siow, to show off your new hair. This is SG$248 and you’ll walk away feeling absolutely pampered and looking gorgeous. But, this week, you can try your luck and win your own hair makeover! 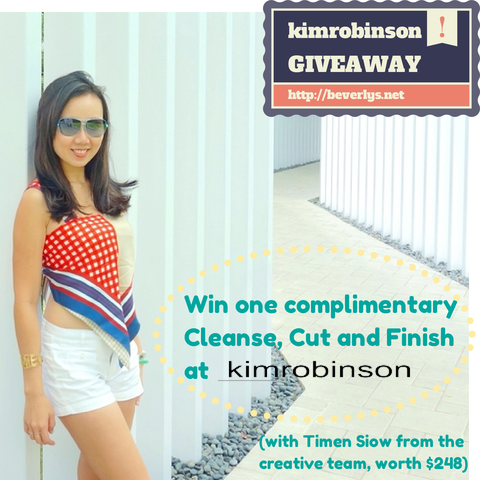 Kimrobinson are giving away one Cleanse, Cut and Finish (with Timen Siow from the creative team, worth $248)! You can submit some of the entries more than once a day, so come back tomorrow to get more entries in the draw. 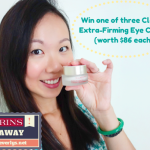 Giveaway will run from 11-17 August 2014 inclusive. 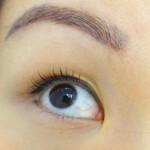 Winner must come in for their Cleanse, Cut and Finish within 3 months after being notified via email. Winner’s entry(s) will be verified according to the entry criteria(s). This is how my hair turned out – my brassy faded highlights turned into an all-over warm shade streaked with dark highlights, and the best blowout I’ve ever had spiked with tons of volume and loose waves. If you can’t wait, pop into Kimrobinson and have a look around or book yourself in for an appointment. Or just be amazed by how huge and luxurious their salon is. Keep your eyes open for a celebrity/socialite or two whilst you’re there! Prices start at $58 for a Cleanse and Finish.